Homeless clients accessing the Basement Advisory Centre support services are being offered free flu jabs throughout the winter period. According to NHS Choices, for most healthy people, the flu is just an unpleasant illness that we can usually recover from within a week. However, certain people are more likely to develop potentially serious complications of flu, such as bronchitis and pneumonia. 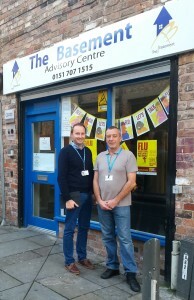 These people should have a flu vaccine each year, which is why the jab is being offered free of charge to clients at The Basement Advisory Centre Liverpool. Individuals who are homeless or vulnerably housed, may be more susceptible to the flu virus due to their poor health and living conditions, therefore the NHS are providing free flu jabs via the Brownlow Centre at The Basement to help those individuals who are most at risk from the virus. The vaccinations will be available on Tuesdays and Thursdays between 5pm and 8pm at The Basement for homeless clients only.